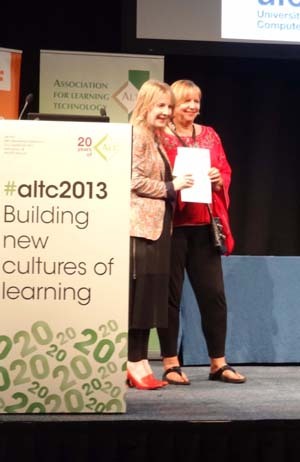 Congratulations to Sheila MacNeill who has become the ALT Learning Technologist of the Year 2013. Sheila, Assistant Director at Cetis, was nominated for her outstanding achievement in promoting learning technologies to the wider UK education sector. Since 2004, Sheila has supported and advised on technical innovation in Jisc elearning programmes including digital literacies, distributed learning environments and curriculum design. Through her Cetis blog, Twitter and meetings she has organised, Sheila has showcased this innovative work. Sheila received her award from Dame Wendy Hall at the ALT-C Gala dinner last night. In receiving her award Sheila thanked ALT and all her colleagues at Cetis, including Christina Smart and Lorna Campbell who nominated her for the award. Sheila reflected that it had been a difficult year for Cetis and hoped the award was the start of good things to come for the organisation. You can find out more about Sheila’s work by watching: “My life as a sponge: soaking up and sowing seeds in the innovation reef” her invited talk at this year’s conference. One of Sheila’s great strengths is her ability to build relationships and work closely with colleagues from right across the sector. We at Cetis are really delighted that she has been recognised for her work.